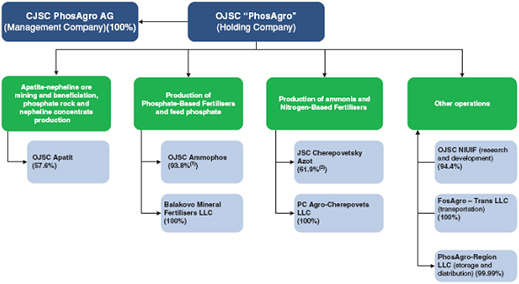 If Phosagro, one of Russia’s leading phosphate miners and exporters, were a Mom and Pop store, the release this morning of the 441-page prospectus reveals that Mom Gurieva and Pop Guriev are selling a good part of the family jewels for cash. The only other seller of shares for the initial public offering (IPO) now under way in London is Maxim Volkov, 39, the chief executive since 2009; he is selling his entire 1% stake. Here is the prospectus in full. Guriev, 51, a member of parliament and the senator from Murmansk region in the upper house, refuses to answer any questions about his business, his share sale, or even his record as a legislator since he took his seat in November 2001. There is no biography of Guriev in the prospectus, and no reference to his role as a senior manager of the company’s assets when they were owned by Mikhail Khodorkovsky’s and Platon Lebedev’s Menatep group. There is no reference to Menatep, Khodorkovsky or Lebedev at all, and no discussion of the controversial acquisition by them of the Apatit mining company by rigged privatization. Khodorkovsky and Lebedev are in jail in part because of their convictions in that affair. Guriev acquired their stakes in a form of management buyout, but at this stage of the IPO marketing process, he omits to explain how a total of 81.23% of the company came into his hands. As Guriev is not a director on the board, there is nothing to explain how the management buyout was funded, and how he got to where he is today. 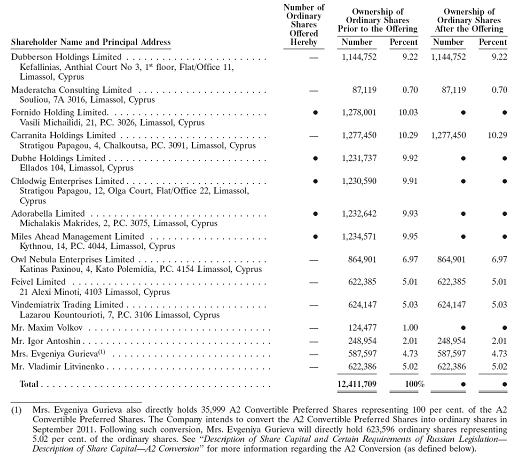 Through their collection of Cyprus entities, Mr and Mrs Guriev appear to be selling 49.74% of Phosagro’s shares. In the right-hand column, listing who will own what stakes after the IPO, they appear to be keeping 31.91%. The discrepancy between what Mom and Pop start with, sell, and end up with is explained by the conversion of Mom’s preference shares into ordinary ones. The transformation of the company’s ownership has not been understood yet in the Russian press, nor in the London market. For the Gurievs are leaving Phosagro, and Volkov may be going with them. But that leaves in place two key state men – Vladimir Litvinenko with 10.3% and Igor Antoshin, with 7.03%, making a total of 17.33% they aren’t selling in the IPO. The table confirms too that Litvinenko holds his stake in Phosagro indirectly through a Cyprus offshore called Feivel and directly through a personal stake. Antoshin’s holding requires a combination of page-turning skills and arithmetic, and you wouldn’t know from Phosagro how significant Antoshin is unless you flip from page 177, where it is reported he owns 7.03% to the table on page 178, where his name is shown as holding just 2.01%. The difference is accounted for by another Cyprus entity called Vindemiatrix Trading, with 5.03%. Antoshin, 48, was a student of Litvinenko and graduated from his institute in 2007. But before he got his academic ticket, he was a senior manager in the Phosagro group of companies. He seems to be an engineer by profession, but how he came by his 7% stake isn’t disclosed. With rock production headed more or less upwards from now, and downstream fertilizer combination exports stable, as domestic consumption grows, what are the chances of a Russian rival persuading the Kremlin to consolidate the entire production chain into a single company, just as the potash business was recently reorganized into Uralkali, using the cut-out services of the committeeman, Suleiman Kerimov and two associates? The IPO prospectus suggests that by stepping out of majority control of the company, Guriev may be taking a two-way bet on this possibility, and setting a market-based exit price if a rival with more clout than he commands aims at taking the remaining 32%, much as Dmitry Rybolovlev was ousted from Uralkali in recent stages. Eurochem is owned by Andrei Melnichenko, an oligarch-sized figure with an interesting history of ownership of such assets as Conversbank and the MDM banking group; and interesting ambitions to build a global fertilizer empire. Acron, owned by Vyacheslav Kantor, sought backing from Prime Minister Vladimir Putin to become a preferred consolidator of fertilizer companies just after the global trade crash destroyed both commodity demand and share prices. Of the buyers of Phosagro’s production outside the group itself, Eurochem ranks first, with 12%; Acron second, with 8%; and Yara of Norway with almost 5%. Sibur, the state-owned spinoff from Gazprom of nitrogen byproducts, including nitrogenous fertilizers, has announced publicly that it is thinking of buying a chunk of the Phosagro IPO. This looks like a revival of Sibur’s ambition to build a state-run empire of all fertilizers, including the mineral type (phosphates and potash), as well as the gas byproducts. According to this chart of Pohagro’s group structure, Sibur holds 28.1% of the voting shares in Cherepovwetsky Azot, Phosagro’s nitrogen fertilizer outlet. Rashid Nureyev, the Sibur spokesman, was asked to say what size bloc of shares Sibur is aiming to acquire in Phosagro, and whether the acquisition is viewed as a step on the road to eventual merger. He didn’t reply. How Phosagro trades is suggested by this disclosure: “In 2008, 2009 and 2010, sales through Ameropa and Mekatrade accounted for 95.6 per cent., 85.5 per cent. and 81.1 per cent., respectively, of the Group’s Phosphate-Based Fertilisers export sales, and 61.0 per cent., 62.1 per cent. and 55.9 per cent., respectively, of the Group’s Phosphate-Based Fertilisers total sales, based on sales volume. No other trader or customer accounted for more than 5 per cent. 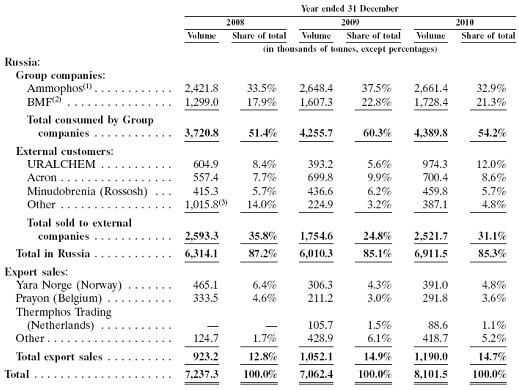 of the Group’s Phosphate-Based Fertilisers total sales in 2010.” Ameropa is a privately owned outfit based in Switzerland; Mekatrade is just as private, and based in Singapore. 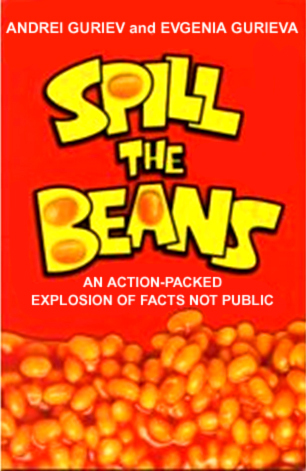 The prospectus admits the risk that if there were to be a deterioration in Phosagro’s relationship with both or either one, this “could have a material adverse effect on the Group’s business, results of operations, financial condition and prospects.” What indirect or protective relationship Phosagro may have in either Ameropa or Mekatrade isn’t known, if any. Ameropa’s website says it trades methanol, grains, and fertilizers from Russia.